This wonderful bike and barge trip that starts and ends in Amsterdam, takes you through the provinces of South and North Holland while spring flowers are in bloom. You will spend time in the historical cities of Haarlem, Leiden, Gouda and Alkmaar and learn about the water management of these lowlands at the North Sea. 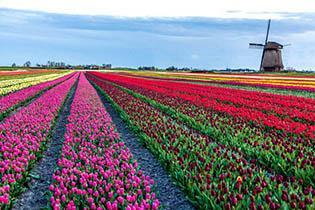 You will also visit the famous Keukenhof gardens, known by the hundreds of thousands of blooming tulips, hyacinths, daffodils and other bulb flowers. The world-famous Aalsmeer flower auction is on the program where an astonishing volume of beautiful flowers are being traded daily and exported all over the world the World. One night the barge mooring is at the open air museum ‘the Zaanse Schans’ with its windmills, cheese farm and picturesque wooden houses. 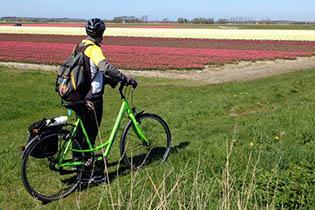 You will be surprised by the beautiful, varied scenery and the wonderful bikeways of Holland. 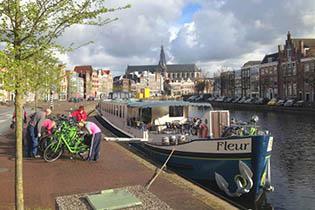 This wonderful bike and barge trip that starts and ends in Amsterdam, takes you through the provinces of South and North Holland while spring flowers are in bloom. This tour highlights some of the most beautiful cities of Holland and Flanders: Amsterdam, Antwerp, Ghent and Bruges, where you still can feel the charm of the days long gone. You can start this tour either in Amsterdam or Bruges. 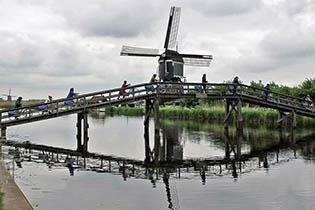 Explore Holland and Flanders at your leisure. You can start this tour either in Amsterdam or Bruges.